Hello, and welcome to episode 211! A ton of news this week. Con season is almost underway, so there's a bunch of announcements there. Some new merch is coming. And of course, we finally have the airdate for the season 8 premiere! And some details about the upcoming season as well. And a bunch of other news. 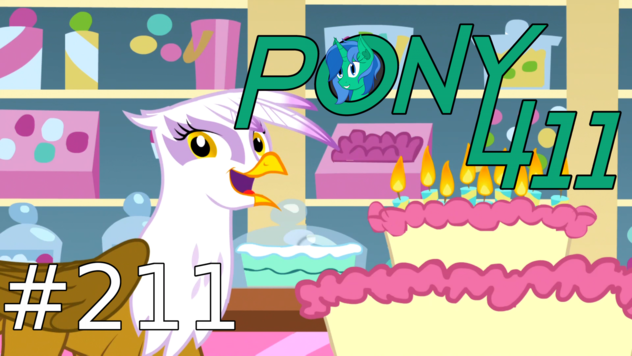 Alca7raz and Nemesis get things started by announcing the winner of the Twitter giveaway, followed up by a review of Friendship is Magic #62! The comic starts off a bit... slow. Unfortunately. But then it's "Griffon the Brush Off," an early season 1 episode! And it's our introduction to Gilda. All of that, plus a bit of fan music at the end. So tune in!